With egg sandwiches and cups of coffee from Pumpernickel Bakery, we set out today — the last day of our trip in Nepal — for Bhaktapur, once a competing capital of medieval Kathmandu Valley. This small city of 65,000 has been wonderfully preserved by a hefty $10 USD entry fee for tourists that goes toward restoration and maintenance. Our cab driver from yesterday, Diamond, took us on the 1-hour drive beyond Kathmandu’s maddening traffic and dropped us off just before Bhaktapur’s vehicle-free zone. “We’ll meet you here in 2-3 hours,” we said. “Sure, no problem,” Diamond replied. We were met with a tout for a guide, Horry, who spoke surprisingly good English. He was willing to show us around for just about $1 USD per person, which we happily agreed to. Horry brought us around the city’s three squares — with towering temples set against a rural backdrop. 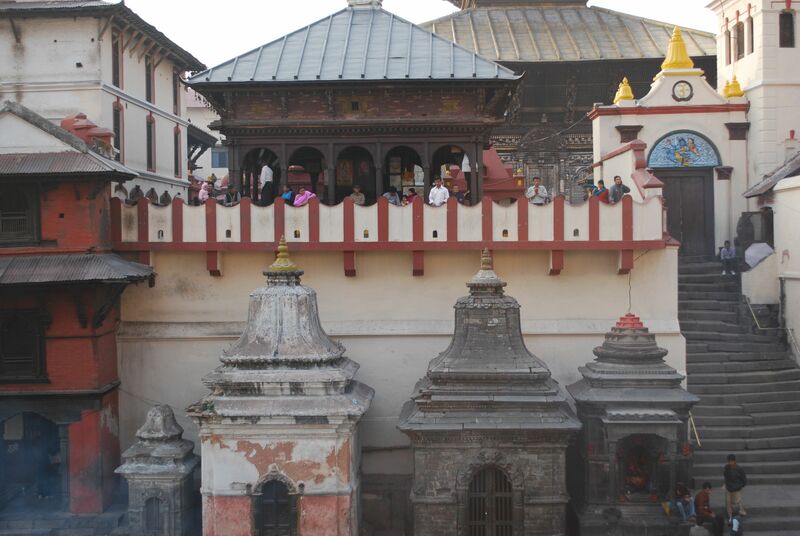 Wandering the narrow cobblestone streets brought us past countless vendor stalls, temples, statues, cisterns and wells. And as promised, the city’s squares were filled with fantastic architecture — exquisite wood, metal and stonework detail. As was somewhat expected, Horry also brought us to a few workshops of painters, potters and woodworkers – those which would provide him with a kickback for any purchases. We negotiated with the artists and ended up buying a few small items. 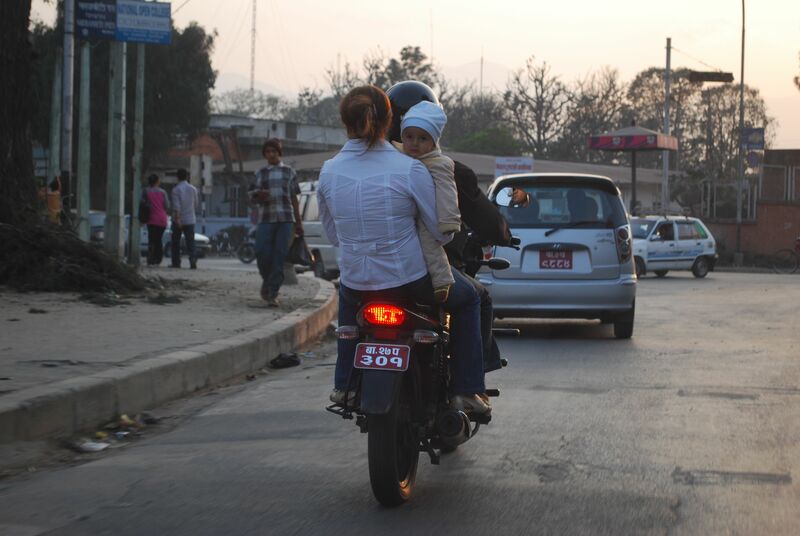 With far fewer tourists to work with, Bhaktapur’s shopkeepers and touts were far more aggressive. A young boy tried to work his pickpocket magic but Ray stopped him from ripping off his wallet. In response, the boy claimed to put some enchanting curse on him. We decided that was enough and it was time to go. Back at the taxi park, there was no sign of Diamond. We searched the lot for his signature white Toyota. We hadn’t yet paid him so there was no reason for him to leave. Meanwhile, other drivers started to aggressively market their services. Convinced that he hadn’t left us (and hoping that he hadn’t taken my Patagonia fleece which was still in the car), John called the guesthouse from a small bodega. In turn, they called Diamond who said that he was sitting in the lot waiting for us. We walked back into the parking lot and realized that Diamond’s cab was grey — not white. At the guesthouse, we grabbed a late lunch, burned through the remaining of our rupees with some last minute purchases, including a couple of thangka paintings from a sustainable shop, and got a $7 USD back massage. Soon, Diamond was driving us again, this time to the International Terminal for our flight back to the Carolina, via Abu Dhabi and New York. As the city’s power cycled off and we weaved through the dark, chaotic streets, barely avoiding animals, vehicles and people, Mike turned to me. “I’m going to miss this place,” he said. This was it. Our last day. And with that encouragement, we began our final descent, retracing the same steps that we took last week. The trail was filled with yak and donkey trains and overburdened porters heading to Namche for the Saturday market. There were also far more trekker groups — making us thankful that we had left just before the start of the high season here. The 12 miles silenced the group for most of the trip. Again, my focus was on one thing: getting home. So, while my camera sat idly in my backpack, luckily Ray felt better about taking in what continued to be one jaw-dropping vista after the next. After lunch, the skies began to darken and the wind picked up. It seemed only appropriate that we end this trek in the same way the we had started it — by dealing with terrible weather woes. Alas, there was little more than a drizzle as we began our final ascent up what seemed like an interminable set of stone steps back into Lukla. And then, in what felt like a strange time warp, we were suddenly back where we started. We collapsed into our beds, had a final bland dinner and then made our way to the village’s only bar. Ordering up Everest beers, we sat inside Wave’s while a cricket match played on a television behind the bar. We raised and clinked our cans in celebratory exhaustion. 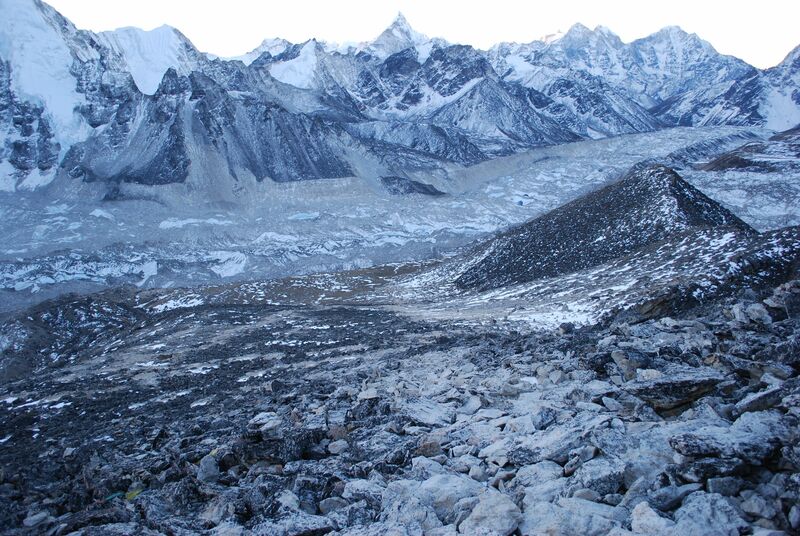 We quickly learned that getting to Everest Base Camp was only half the battle. 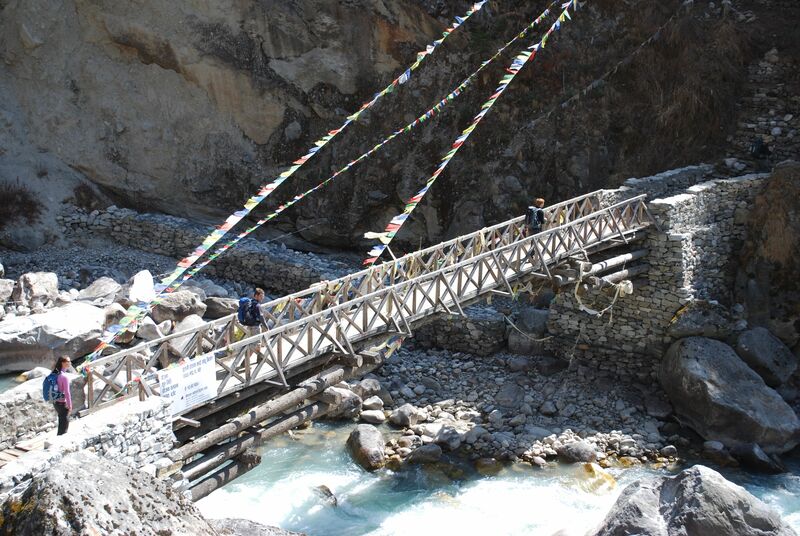 Indeed, the 40-mile return to Lukla was just as, if not more, challenging. By this point, many of us are hinging on near exhaustion. Our knees ache from the constant downhill pounding. We are congested and coughing from the dust kicked up on the trail. We are hungry for a meal beyond rice or noodles. We are cold. And we need a proper bed and toilet. We’re ready to go home. As we slog along the trail, I’ve asked two Canadians who have recently tackled the summit of Kilimanjaro a simple question: Which was harder? Easily, I’m told, it has been this trek to Everest. While Kili is about 1,500 feet higher, the trip itself is only 5-7 days, only one of which is above 16,000 feet. Our trek to Base Camp has been about twice as long and we’ve spent the last three days sucking for air above 16,000 feet. We quietly all pat ourselves on the back and then refocus on the task at hand. As the day wore on, we continued to retrace our steps, passing the stone ledges where we frequently rested and those pleasant restaurants where we soaked in the fantastic views over cups of Hot Lemons. There was little talk on the trail except for the occasionally obscenity yelled by our Australian group mate. “I’m sick of this,” he muttered as we began a 45-minute dusty descent that crushed our joints. Secretly, many of us agreed. My camera stayed in my backpack for most of the day but thankfully Ray, a well-traveled guy from the UK, snapped some pretty fantastic shots. Soon, Namche Bazaar came into view and many of us could barely hold back our excitement for a return to reality. There were hot showers here! And Internet! Small bodegas that sold Diet Coke! And we could breathe! It was like we had arrived at Nirvana. Showered and well fed, we sucked down Everest beers and started to reflect on what we had actually accomplished — how far we had gone and the blur of a past week. At the table next to us, a group of trekkers chatted about acclimatization. They were clearly headed up the mountain while we were joyously heading down. Part of me wanted to let them know what they were in for. But another part thought it might be best for them to experience it for themselves. Who would have thought that you couldn’t actually see Mt. Everest from Everest Base Camp? It’s crazy but true. After climbing into bed at 6 p.m. last night, my pounding headache prevented sleep. So, when our guides came to wake us at 3:45 a.m. for a trek to watch the sun rise over the tallest mountain in the world, it was pretty simple for me to get up. With headlamps, we set out into the pitch black and began almost immediately an ascent. 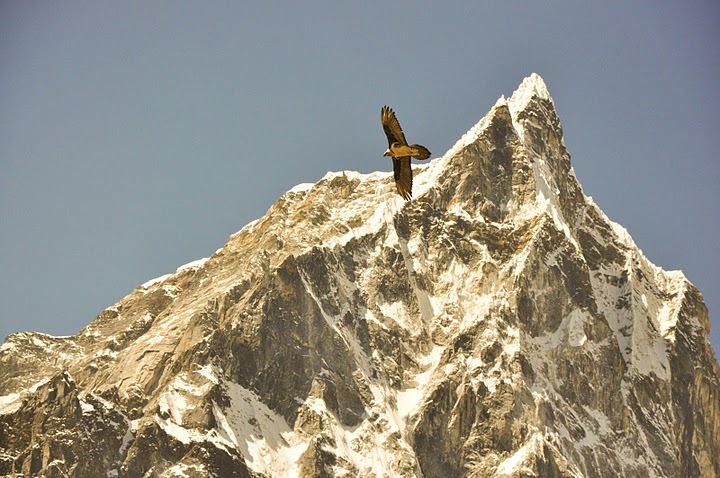 Stopping frequently to catch our breath, we watched as my altimeter showed our rapid climb that quickly broke 18,000 feet as we reached the summit of Kala Patthar. The temperature outside was barely above the single digits — which we were frequently reminded of as we attempted to drink water from our frozen Nalgene bottles. As dawn slowly broke, we were blown away by the views, not just of imposing Everest (although impressive), but the surrounding landscape. When we finally reached the summit, stamping our feet to stay warm and sucking down air, my watch indicated we were at nearly 19,000 feet. We had just enough time to snap a few photos of Everest before we (literally) jogged down the mountain in order to escape to the warmth of the lodge. After breakfast, we began our accelerated descent back to Lukla. Because our flight had been canceled and we had lost a day, we now had just three days to cover the same ground that we had checked off in the previous eight — about 40 miles and 3 vertical miles. Luckily, the sun warmed up the temperatures and our acclimated bodies had less difficulty tackling the Nepali Flats. Indeed, the afternoon trek felt almost leisurely as we all had an opportunity to breathe a big sigh or relief. For the first time in over a week, we could also walk with our heads up – and continue to try and take in all of this amazing natural beauty. Our altitude quickly dropped as we retraced our steps. A few miles beyond the Everest memorials, we descended a steep hill into a valley. Here, our next stop, Pheriche, came into view. The Panorama Teahouse offered just that — stunning views, but more importantly, a comfortable place to rest our weary heads. Which was the first priority. The thermostat could not have been above 10 or 15 degrees this morning. It was 5:30 a.m., the skies were still dark and we were freezing. Yet, there was a sense of nervous excitement downstairs in the dining room as we sipped our black teas. A week after arriving in Lukla, we would reach Everest Base Camp this afternoon. But today would also be one of — if not, the most — difficult days of the trip. Dawa estimated a 9-hour, 10-mile trek, certainly our most strenuous. And to make matters more challenging, nearly all of this would take place above 16,000 feet. By 9:30 a.m., we arrived at Gorak Shep, a village that sits atop a small, frozen lake. Gorak Shep was the base camp for the failed 1952 Swiss expedition to Everest. There is little to see here; it’s simply a resting point. So after an early lunch of tuna fish sandwiches, we continued northward. About halfway there, we caught a glimpse of Everest — its scary and intimidating black peak poking far beyond all of the surrounding mountains. Here, it’s above my right shoulder. The last half mile was slow going, essentially ice trekking, as we slowly crossed onto the glacier with its 50-foot tall seracs of ice. Then, finally, it came into sight: a small mound of rocks, a few prayer flags and a handmade sign proclaiming three sweet words: Everest Base Camp. We were standing at 17,598 feet. There was a little less than 50% oxygen in the air. As the season is young, there was little life at Base Camp. The expeditions generally don’t start setting up shop here until next month. But for a couple of minutes — as the next group of trekkers approached — we had Base Camp all to ourselves. Wind off the mountains picked up. And hearing nothing but Everest’s wrath, we took it all in. Then, after celebrating for no more than 15 minutes an accomplishment that had taken us over a week, we simply turned around and started back home. In Gorak Shep, the effects of altitude quickly set in. Terrible pounding headaches plagued most of the group. We agreed to have dinner at 5 p.m. not because we were starving — but so that we could go to bed immediately after. But it would make no difference. At nearly 17,000 feet, there would be no sleep tonight. Although today’s trek was only 4.5 miles, there was a vertical gain of over 2,000 feet. We knew that we would have our work cut out for us. We started with some Nepali Flats — an accurate description of the undulating hills that have characterized much of the trek. Climb up, see false summit, climb down. Rinse. Repeat. Hiking through alpine meadows and summer yak pastures, we were led toward the end of the moraine of the Khumbu Glacier where there was a steep, tough climb. We stopped for lunch at 9:30 a.m., a regular occurrence on the trail. While the group was chowing down on tomato soup and fries, a scenic overlook provided a quiet place for me to rest and take it all in. Properly fueled, we began a tremendous ascent — here, you can see the trail, as well as our yaks in the lower right hand corner, for some perspective. The trail was slow going, as we scrambled over boulders and took plenty of rests. At the summit on Thok La was a memorial to the dozens of climbers and Sherpas that have been killed over the years while attempting Everest. 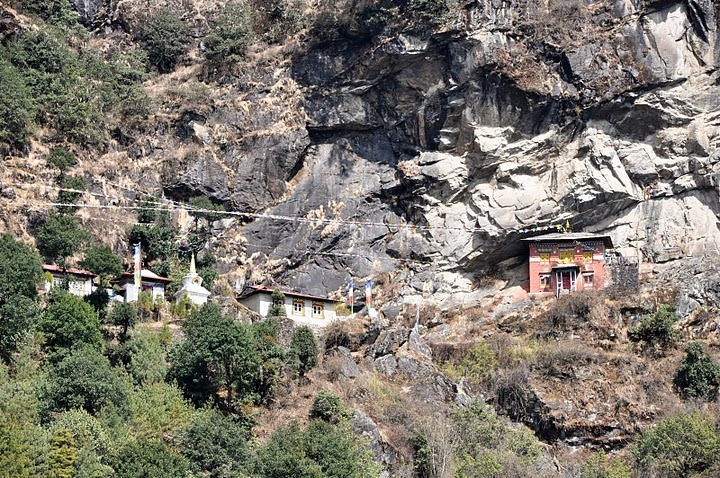 We wandered the various chortens (stone monuments), including that of Scott Fischer, one of the guides involved in the 1996 disaster, and thought about why so many fearless, yet often ordinary folks, would take on such inherent risks. From here, the view out straight toward Nuptse was truly magnificent. Given how beautiful and peaceful it was, we decided to have an impromptu photo shoot. Back on the trail, we continued to gain elevation and climbed onto the Changri Glacier before arriving in Lobuche, a small village with nothing more than a few teahouses. It had taken us nearly all day to hike just 4.5 miles. With pounding headaches, we rested at the Sherpa Lodge, a truly awful place with terrible facilities and freezing cold rooms. Dinner involved some creative thinking on my part — a can of tuna fish, some toast and a tube of Pringles, all for about $10 USD — and offered just a small reminder of life back home. But it also gave my body the important energy required for tomorrow when we would set out for the destination that we had come all this way for: Everest Base Camp. It was nice to “sleep in” this morning — that is, wake up after the sun was up. Similar to our second day in Namche, today was a rest day, designed to facilitate our acclimatization. Still, a rest is not really a rest in the Himalayas. It’s important that you remain active, to keep the blood flowing in your body and facilitate the process. “No sleep,” Dawa said. Instead, he had planned for us a hike up the Imja Khola to Chhukung, a small summer settlement from where the views of Island Peak, Lhotse, Ama Dabalm and the fluted ice walls flanking the Amphu Lapcha pass were one of the highlights of the entire trek. We ascended to about 14,800 feet and gazed up. Even here, nearly five miles above sea level, these monster mountains soared above us. It was humbling. At Chhukung was a small stupa adorned with prayer flags and a stupa — whose eyes looked out all-knowingly into the distance. Shielded from the wind, we spent about an hour taking in the views before descending back to the teahouse. The afternoon was dedicated to reading, playing Uno and walking around the village, which didn’t offer much beyond a couple of small convenience stalls. 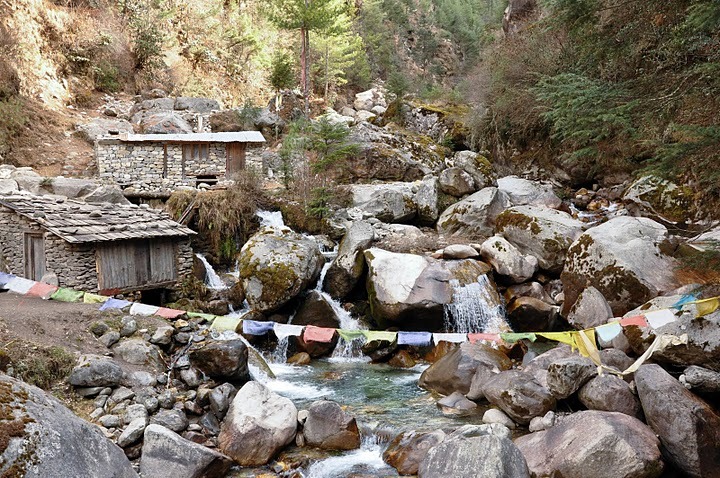 Many of us opted for $6 USD hot showers — our last before hitting Base Camp. Veggie chowmein for dinner was surprisingly decent, the best meal that I’ve had in a while. Retiring to my single “suite” with a hot water bottle, lights were out no later than 7:30 p.m. The thermostat was in the mid-twenties when the sunrise woke us this morning. While difficult to get out from our sleeping bags, the dawn — with its perfect lighting for photos — was compelling enough. We watched as the sun slowly rose, illuminating the face of Everest in the distance and a conch shell blew from the monastery called the monks to prayer. After breakfast, we descended steeply through rhododendrons, birches and conifers, crossed a river and then began climbing upward. Today’s trek was about 5 miles but as we cruised above the 14,000-foot mark, became increasingly difficult. At this altitude, the landscape changes markedly — trees cannot survive here – as we entered alpine meadows of scrub juniper. Occasionally, a rescue chopper flew overhead. During the high season — which begins next month – our guide, Dawa, said that there could be several dozen trekker evacuations per day. Yet, altitude or not, the more we walked, the more dramatic the terrain became. We were encouraged as we approached the village of Dingboche, knowing that we would have two days here to rest and acclimate. By this point, nearly everyone in the group is feeling some symptoms of the high altitude: whether it’s headaches, achy joints or popped capillaries. But, generally, we’re still in pretty good spirits. Chapatti and peanut butter is my new breakfast staple. Only several days into the trek and I’ve already gotten tired of the food of Nepal. The country’s national dish is dahl baht — a bland concoction of rice, steamed vegetables and lentil mush. Ascending toward Base Camp, eating has taken on a whole other purpose though. We eat because we must. There is no meat on the teahouse menus and even vegetables are of questionable quality. Dishes revolve around potato, noodle and rice — there is little culinary experimentation up here. And the bland food isn’t helped by the fact that higher altitudes cause gases in the stomach to expand, reducing appetite. So, it was with excitement that chapatti, a simple, unleavened bread, with a smear of peanut butter really hit the spot. It would become my breakfast of choice for the rest of the trek. Leaving Namche, the route was unbelievably beautiful — the Dudh Kosi was far below and Thamserku, Kantega, Ama Dablam, Lhotse and Everest rose in front of us. From here, we really could begin to appreciate the amazing magnificence of this setting, dwarfed at nearly 14,000 feet by six out of ten of the tallest mountains in the world. A lone stupa sitting on the mountainside provided a scenic resting spot to take in the views. We trekked for 6 miles through woods, rhododendron forests, mani walls, chorten and water-driven prayer wheels. Crossing suspension bridges, we arrived at the base of a steep and dusty ascent and fueled up on egg chowmein at a small riverside restaurant. The ascent up to Tengboche rivaled that of the ascent to Namche but we felt better acclimated and prepared to tackle it. Still, we were quite tired when we finally rolled into our teahouse, Tashi Deleck, but were absolutely blown away by the setting of the famous Tengboche Monastery, which we visited shortly after setting our bags down. Unfortunately, the teahouse didn’t come close to matching the imposing scenery and as darkness and the thermostat fell, we began to nervously anticipate the evening. Our rooms had no blankets and were only moderately protected from the elements. There was no indoor toilet and the sink consisted of a tub of water in the courtyard. We filled our Sigg bottles with boiled water and took them into our cocooned sleeping bags. Wearing three fleeces, it wasn’t nearly as cold as I’d thought it would be. That is, until the time came to get up in the pre-dawn morning.